“We are bringing together some of the greatest minds in design, development, architecture and planning to spark a conversation about what it means to build and live in a great city,” says moderator and co-producer Rick Epstein of Studio Completiva. We are seeing dramatic changes to our cities along the Front Range. While some changes have been met with universal acclaim—Union Station and the Fastracks system—many other projects (apartment housing, civic buildings, office buildings, etc.) have fallen short of creating inspiring places that contribute in a meaningful way. These buildings often feel more like short term commodities. 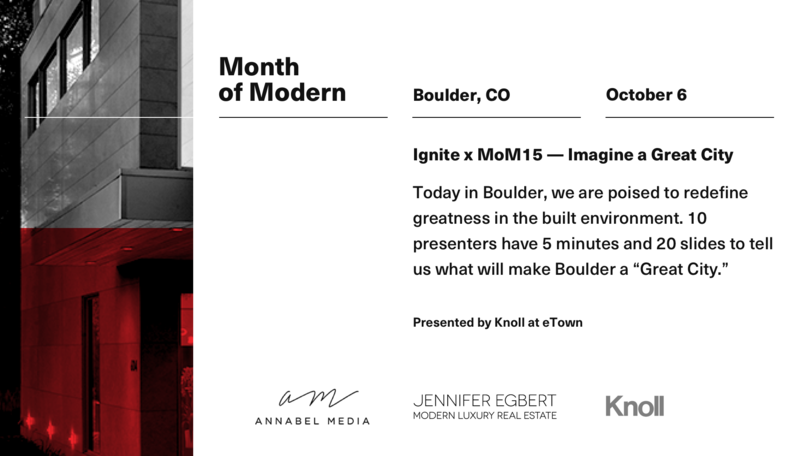 “Month of Modern was founded as a way to spark a much-needed conversation about design in Colorado,” says Month of Modern founder Kate Bailey of Annabel Media. Remove the politics, take away the have and the have nots, eliminate the question of what is good or bad design. There is no better time than now to create a truly engaging, dynamic discussion about the future of our communities, and there is no better forum than Ignite.